Dubai: Picture this. You have won a million dollar lottery. Before you disclose this exciting news to the entire world, your friend calls up and says that he has also hit the jackpot for the same amount. That is exactly what happened to Michael McGinley, the first Irish winner of Dubai Duty Free (DDF) Millennium Millionaire raffle. Within minutes of McGinley being informed about becoming the winner in Series 296 with ticket number 4143 on March 26, he got a call from his golf buddy Mukhtar. M.
“When I got the call from Duty Free, I was like Oh My God! I needed to verify it before telling anyone else. I was checking the Facebook live to see if I had actually won. Then I got a call from Mukhtar asking — did you just win one million dollars. I was shocked. I wondered how he got to know that! Then he said he had won it too. It was such a coincidence!! !”, McGinley told Gulf News. It was a double shock (though pleasant) to Mukhtar also. “Winning the raffle was the first shock. Knowing that Michael had also won it in another series was the second shock,” said Mukhtar, a Canadian national of Indian origin who became the winner in Series 297 with ticket number 2060. 1. 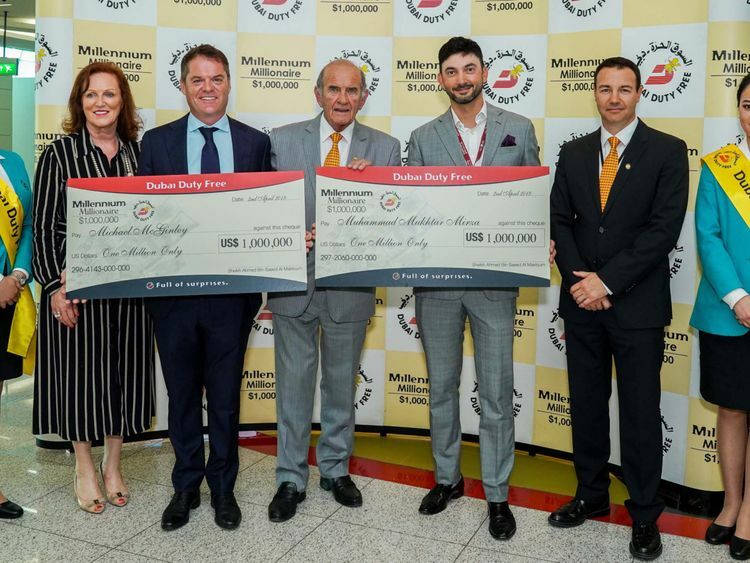 Michael McGinley and Mukhtar M sharing a light moment after winning $1 million each in Dubai Duty Free Millennium Millionaire raffle. Members of Dubai Creek Golf and Yacht Club, the duo have known each other for about six years. They had also gone on a 10-day group golf tour to Ireland last year. 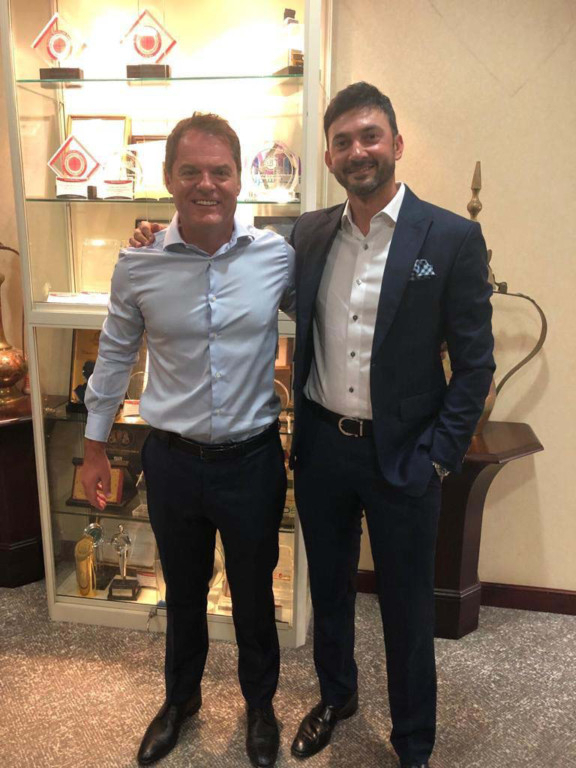 Brother of Irish professional golfer Paul McGinley, Michael McGinley is well known in the Middle East travel retail for his work with a leading technology distributor. He is also a top-class golfer and regular participant and prize winner in the Dubai Duty Free Golf World Cup. Heading a real estate brokerage firm, Mukhtar is also an avid golfer, and former Club Champion at Dubai Creek Golf Club. One of his most memorable golfing highlights is reportedly competing in the European PGA Tour’s 2010 Dubai Desert Classic as an amateur, alongside some of the world’s top professional golfers. While McGinley was trying the luck of the Irish by purchasing the DDF raffle ticket when he flew out to his home country, Mukhtar had purchased the winning ticket at the Tennis Village during the recent Dubai Duty Free Tennis Championships. However, both the bachelors had no clue that they will be striking it rich, not through golf, but the DDF raffle. “Golf could be the lucky charm as both of us won it on the same day,” Mukhtar told Gulf News. He said he plans to use the money (Dh3.67 million) for his family, and his studies. The 37-year-old is currently doing an MBA from the London School of Business. While McGinley bought the ticket as a gift for himself, he has already committed to donate a portion of the fortune to the DDF Foundation which mostly raises funds for the disadvantaged children in various countries. Apart from that, McGinley still has not figured out how he would make use of the unexpected fortune.